With just a few days to go until the world championships in Aguascalientes, and April 2013 being my last blog entry, I thought it was about time to do a give you a bit of an update. It’s hard to believe that it’s been almost 2 years since the last major competition on the track. Of note the only competitions I’ve competed in have been the National Championships, and the ParaCycling Cup in Newport Wales last November. These events were an enjoyable return to racing, and I had a fair amount of success at both. Breaking the kilo WR twice (although neither has been ratified), along with winning 2 golds and 2 silvers at the Newport event. The 2nd gold coming in the scratch race, a new event in the ParaCycling programme. Having had so few racing opportunities it’s been very hard to motivate myself and keep on top of my game, but having set myself multiple goals in training it’s kept me fresh leading into these championships. Everything in the run up to this competition seems to be going really well. I’ve had multiple PB’s in training, and my confidence to perform at this meet is sky high, I just can’t wait to take the start line now. Mexico is going to be an interesting challenge, as there are one or two things here that certainly aren’t the norm. Track temperature is the first challenge, with it being over 40 degrees C in track centre during our first training session, staying cool and most importantly hydrated is going to be most important. One positive though is that our muscles work well when they’re nice and warm. The next thing to deal with is the altitude, with the velodrome situated at over 1800m there’s certainly less oxygen in the air. I have a feeling the pursuit and scratch races are certainly going to be hard work, as they are aerobic races. The sprint events should be easier on the breathing, although we’re all noticing that we have to breathe harder to recover after any effort. Again there are positives to this altitude, the air is thinner so it’s easier ride through, which in turn means we go faster, which is always a positive. If the recent able bodied world cup is anything to go by it wouldn’t be a surprise to see the world record broken in every event here, it’s that fast! Another challenge we’ve been facing as a team, is the fact we can’t eat any of the meat out here, well certainly not any of the Mexican sourced meat. There have been numerous cases of contamination with the banned substance Clenbuterol. As such we’ve been eating a lot more fish, mainly tuna. So far so good, but think it may wear thin before the end of the competition. I do know that on my return to the UK I shall be heading to the nearest steak house! The final challenge for me is going to be my own performance. For 2014 I’ve been working specifically on the kilo event, and as such my training has been very strength and speed focussed, which is great for my favoured event and the team sprint, however as I’m the designated points scorer in the C4 class for the Rio qualification process, I’ll also be riding in the 4km Pursuit and Scratch race. Both are endurance events and certainly will be testing the small amount of endurance work I’ve done in the run up. Today is my last training session before the competition starts on April 10th. I’m ready to go, and looking forward to blasting out of the start gate. Hopefully I’ll update you on here, as the racing gets under way. But be sure to check out the official event website (www.eventosdeportivosidea.com), and my personal twitter feed (@jodycundy) for up to date news. 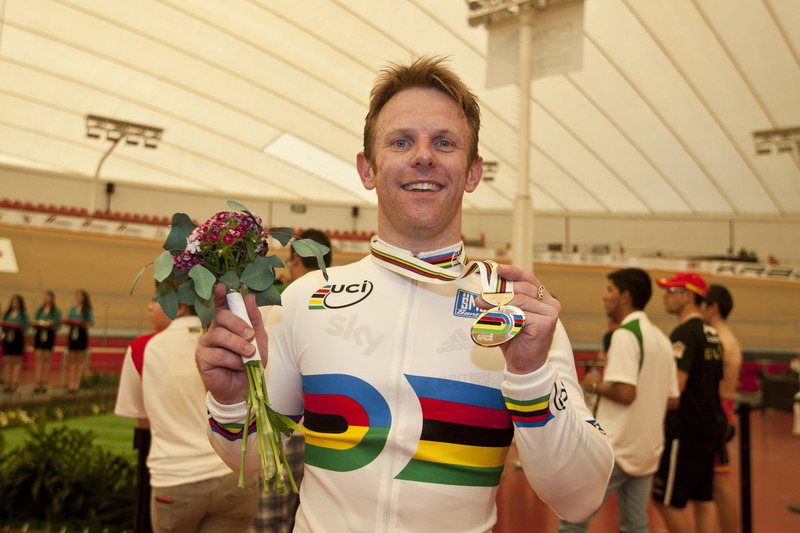 Really interesting, honest blog from @jodycundy on the eve of the Para-cycling Track World Champs http://t.co/pmsZIzsYak Hope he wins big!